Basil (Osimum basilicum) is a member of the mint family. There are several types of basil. All are edible, but have different characteristics such as plant size, leaf shape, color, and flavor profiles and are suited for different purposes. The most common culinary type is sweet basil, but specialty types include Thai, purple, lemon and small-leaved bush types. Basil seed is not always true to type. Try to obtain high quality seed that is uniform with a high germination percentage. Because it is highly sensitive to cold, basil is often started indoors and transplanted after danger of frost. Prior to transplanting, plants should be 6" tall (four to six weeks old) and can be pruned to encourage branching. Basil seeds will germinate within 8 to 14 days at soil temperatures between 65°F and 80°F, with an optimum of 70°F. 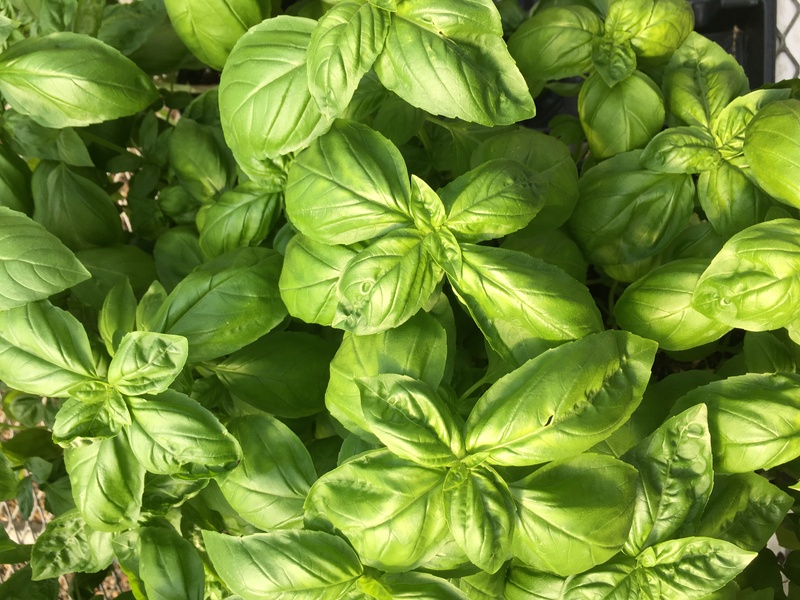 If field soils are warm enough, basil can be direct-seeded in a well-prepared seedbed at a spacing of eight to 10 seeds per inch and later thinned. Basil is often grown at a spacing of 6" to 12" between plants in double-rows on black plastic mulch on beds 2' to 4' wide. Basil grows well in a warm, well-drained soil with pH 6.0-7.5 and requires adequate soil moisture throughout the growing season. Drip irrigation allows consistent application of water while also reducing foliar diseases. Although adequate fertility is required, excess nitrogen applications can cause post-harvest discoloration and reduce flavor. Basil is first harvested 60 to 70 days after seeding. Harvests should take place in the morning after the dew has left the plants. Depending on the intended use and market, individual leaves or entire tips of stems may be harvested. Plants may be harvested every one to seven days, depending on the amount removed. Basil can grow up to 1" per day and can be harvested one to five times throughout the season. Plants will set seed if flower spikes are not removed as they appear. Fresh basil is easily damaged by rough handling, dessication and chilling (<40°F). Basil can be cooled by rinsing in cool (55°F) water, but should be dried completely prior to packing. Cultural management of insects, diseases and weeds are necessary because few insecticides, fungicides and herbicides are registered for use on basil. Suggestions for weed management in basil include use of the stale seedbed technique (see page 44) and use of plasticulture. Both glyphosate (Roundup) and pelargonic acid (Scythe) are registered for stale seedbed use. Flaming can also be used. Stale seed beds can be used between plastic mulch (be careful with flaming as it melts the plastic). Basil usually grows quickly and shades the planting hole in plasticulture, out-competing weed growth. Apply the plastic at least two to three weeks prior to planting and kill the weeds between the mulch prior to setting the basil plants on the plastic. On bare ground culture, keep cultivations shallow to protect crop roots. Do not move soil into the crop row as basil plants may be more susceptible to diseases when soil is mounded against the stems of the crop. For Current information on production methods (including varieties, spacing, seeding, and fertility), weed, disease, and insect management, please visit the New England Vegetable Management Guide website.